Venezuela’s historical traditions are among the underlying causes of the current standoff and are frequently overlooked as such. The decision by Juan Guaidó and his colleagues to proclaim him the country’s interim president on January 23 is not the first time this has happened. In fact, this day marks the anniversary of the 1958 revolution that ended Marcos Pérez Jiménez’s dictatorial rule. His removal from power was a true revolution executed by various political and social forces, including organized labor, students, and the military. As a result, Admiral Wolfgang Larrazábal headed the transition government. The key takeaway from the 1958 revolution is that different political forces were able to come together to achieve a common objective, even though they parted ways soon after the coup. Thus, January 23 is a date that unites all Venezuelans. All Venezuelans coalesce around the cult figure Simon Bolivar, who is also known as the Liberator (El Libertador). Hugo Chavez’s supporters went so far as to change the country’s name to the Bolivarian Republic of Venezuela. The fact that Juan Guaidó had a portrait of Simon Bolivar in his hands at the rally during which he was declared interim president, was no coincidence. Referring to historical traditions is an essential aspect of Venezuelan mentality that has to be taken into consideration. The second cause is very much the result of the economic crisis ravaging the country. This is attributable to both objective and subjective factors. The main objective factor is that Venezuela was hit hard by the dip in oil prices. When the price of oil was higher, the government used the proceeds to finance a social safety net. This boosted the popularity of the Hugo Chavez regime, especially among low-income households who benefited the most from this social spending. The government of late Chavez and the current Maduro government have always relied heavily on this part of society. The country’s financial reserves also enabled Venezuela to carry out an independent foreign policy with Hugo Chavez, together with Fidel Castro, spearheading the establishment of the Bolivarian Alliance for the Peoples of Our America, an effort designed to promote integration among Latin American and Caribbean countries around a consolidated foreign policy agenda. This alliance benefited poor countries that received oil from Venezuela at reduced prices. 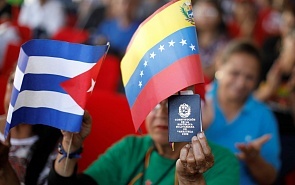 The crisis was also caused by economic policy missteps by the Nicolas Maduro government that then had to face an unfavorable economy when it came to power. Continuing the old economic policy, including nationalization, was a serious mistake in a time of falling budget revenues. Many leftist regimes have committed the basic error of keeping large-scale welfare programs in place while lacking the resources to fund them, as exemplified by the Popular Unity ruling party in Chile. Though to be fair, this happened in a different country, within a different political system and at a different moment in the country’s history. The next mistake relates to both the government and the opposition. In almost 20 years the government and the opposition have never learned to talk with each other, let alone understand each other or consider compromise. This is a serious shortcoming in Venezuelan society and for the state. We can now see the results of this lack of understanding. The same words can be heard from both camps. Everyone talks about democracy, legitimacy and human rights, but they interpret these terms differently, and sometimes in conflicting ways. This is a global, not just a Venezuelan, dynamic where the government and the opposition are unable to listen to each other. The Maduro government also committed another major error, but sees it as an achievement. The failure to understand the opposition’s demands is caused, among other things, by a deadlock that has been in place since the parliamentary election. The opposition won the majority of National Assembly mandates, prompting Hugo Chavez supporters to simply walk away and establish their own Constituent Assembly with the opposition refusing to take part in its election. The Constituent Assembly was tasked not only with drafting a new constitution, but also to act as a legislative authority. As a result, Maduro consolidated his grip on both the executive and the legislative branches. However, the National Assembly has remained in session, and has been adopting laws and cancelling some of Maduro’s policies, that were then overturned by the Supreme Court that was appointed between the two elections. Does the Crisis in Venezuela Mean Collapse of Chavismo Ideology? Regardless of who wins in the Venezuelan crisis, Nicolas Maduro or his opponents, the results of the Chavista policy today make it fully justified to ask whether there is any radical limit in left-wing politics in the modern globalized world. As a result, part of Maduro’s overt and latent base is now in opposition to his rule. This is the case, for example, with the former Supreme Court members who left the country and are trying to perform their duties from abroad. Prosecutor General Luisa Ortega is an example: she left Venezuela and criticizes the executive branch from abroad. All in all, the country found itself in an extremely intricate and contradictory situation. The Venezuelan opposition is quite diverse, spanning both right and left forces. One thing that unites all these forces is the rejection of Hugo Chavez’s ideology. The strength of the opposition is that its members are united against Maduro, but this is also its weakness. The opposition lacks a common program for reforming the country, which could become a serious challenge if it comes to power. The same happened in 1958 when unity within the opposition broke apart right after the revolution. When Romulo Betancourt was elected president a year later, some of the forces that helped bring down the dictatorship started a guerilla campaign against the government that went on for years. The fact that the opposition lacks deep insight into the problems the country is facing is a major issue. Today, Russia has made clear its commitment to lending its political support to the Maduro government. It is hard to imagine Russia backing a regime change in Venezuela, given the good relations it has built with the country. What could the opposition’s stance be on Russia? In his interview with the Russian newspaper Kommersant published last year, the then rank-and-file opposition MP Juan Guaidó said: “Regardless of who runs Venezuela, we want to maintain relations with Russia. There should be no doubt about this. Maduro is worse than the opposition for the US, Columbia and the entire world. In fact, the Chavists destroyed the manufacturing sector, and undermined investor trust. The country is mired in corruption. This government is bad for everyone.” Despite promises by a leading opposition figure to maintain good relations, it is understandable that the Russian authorities oppose any radical and basically illegitimate approach to resolving political problems. As for the US and Latin American countries that have already recognized Juan Guaidó as interim president, this is something they have been aspiring to for a long time. It is obvious even for those who reject conspiracy theories that an entire coalition of Latin American countries denied the Maduro government legitimacy. This is partly the result of last year’s presidential election that was boycotted by almost all opposition parties. The number of people who cast their ballots in the election was half that of the previous election when Maduro beat his top contender, Henrique Capriles Radonski, by just 1 percentage point. The same applies to the last parliamentary election won by the opposition. With all this in mind, opposition activists insist the 2018 presidential election was illegitimate and failed to represent the will of the people. However, the Venezuelan opposition has one major shortcoming: when they do not like something, they just walk away complaining that something is wrong. They would be better off fighting at the polls.